A Hollywood star attempts to escape his past by directing and starring in a stage adaptation of a Raymond Carver story. In a piece of casting that's either subtly genius or crassly obvious, Michael Keaton is Riggan Thomson, a burnt out Hollywood star best known for playing the title role of the 'Birdman' superhero franchise two decades ago. In an attempt to escape his past, Riggan finds himself in a rundown theatre off Times Square, where he is directing and starring in an adaptation of Raymond Carver's short story What We Talk About When We Talk About Love. Haunted by the memory of the costumed character that made him famous, Riggan struggles to keep both the production and himself afloat as he clashes with fellow actors, critics and estranged family members. 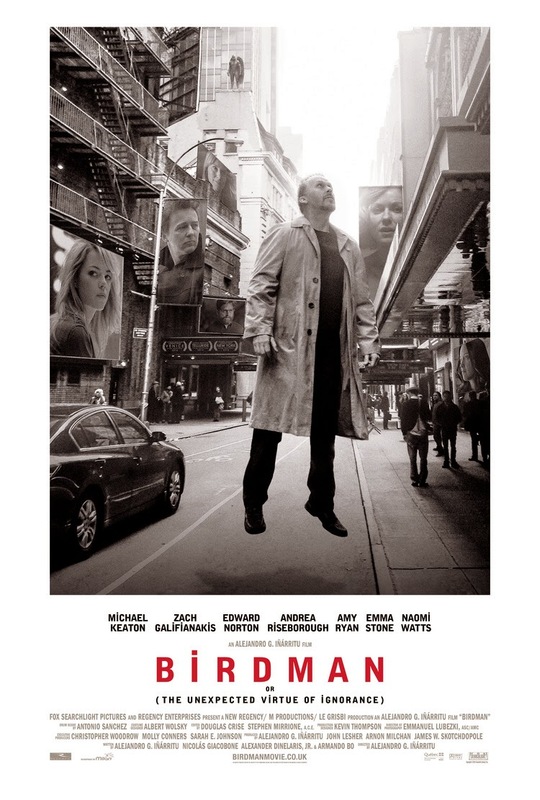 Nothing particularly original or interesting about all that you might say, but what elevates Birdman from the mediocrity of its premise is the visual trickery employed by director Inarritu, his ace DP Emmanuel Lubezki and a talented FX team taking on the thankless task of making sure their work is invisible. Just as Mikhail Kalatozov's wandering, restless camera took us on a "how the hell did they do that?" propaganda tour of Havana in 1964's I Am Cuba, here Inarritu guides us through the cavernous backstage corridors of his theatre location, but also takes us inside the quite possibly deranged psyche of his protagonist. Shot for most of the running time to appear as one continuous unbroken take, Birdman's camera not only manipulates space, but also time, with days turning into evening over the course of a cleverly choreographed pan. There are two especially bravura sequences; one involves Keaton running through Times Square in his y-fronts, surrounded by genuinely bemused members of the public, while the other sees his character literally take flight over the rooftops of Manhattan, only to land on the pavement and re-enter the theatre in the "how the hell did they do that?" moment of 2014. When, towards the movie's climax, the one-take aesthetic is broken by a dreamlike montage, the effect is like being awoken by the clicking fingers of a hypnotist, but it also exposes how brittle Inarritu's film is once you remove the technical prowess. Keaton is fantastic, as is the rest of the cast, with Norton pocketing every scene he appears in as a hyper-real version of his own notoriously pompous persona, but the material they're given to work with is tired and stale. A rehash of themes already covered by the likes of Network and The Larry Sanders Show, with sight gags borrowed from 40 year old Mel Brooks movies, Birdman's script adds little to the never-ending art versus commerce debate. In a year that's given us smart and witty blockbusters like Edge of Tomorrow, Maleficent and Dawn of the Planet of the Apes, Inarritu's potshots at Hollywood come across as sour grapes. Positing the malicious, spiteful critic played by Lindsay Duncan as the film's cartoon villain seems like a case of biting the hand that feeds you, for whom else but the critical community does Inarritu have to thank for his career? Certainly not audiences; they'd much rather pay to watch the superhero movies he mocks here. With Duncan's writer only respecting artists who literally spill their blood on the stage, it seems Inarritu is confusing critics with awards voters. Along with Boyhood, Birdman is the current favourite for a Best Picture Oscar on February 22nd. Should either win, it will constitute a rewarding of toil over talent by an institution that, like a narrow minded sports coach, judges talent in litres of sweat.